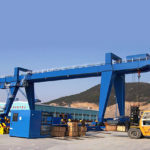 Rail mounted gantry crane is one of the most common types of gantry lifting equipment used in outdoor workplaces, often called RMG crane for short. It is a kind of fixed gantry crane, travelling on the track of ground, and is capable of covering a large lifting space. As a highly efficient material handling equipment in many industries, this gantry crane has high performance and helps boost the productivity of your business. The rail mounted crane can also be used for loading and unloading containers in port and dock with features of high operating speed and working level. Our rail mounted gantry cranes are designed in two main configurations including single and double girder. Other designs such as box and truss forms, with or without cantilever are also in option. Besides, we supply customized rail mounted gantry crane design for your special application. To reduce lifting and transferring times of heavy loads and promote efficiency, the rail mounted gantry crane is introduced in many industries. It is applicable for power station, construction site, port and rail terminals. The rail mounted cranes we manufacture have many advantages. The overhead gantry crane has strong adaptability, suitable for various working site conditions. The rail mounted crane has long service life and requires little maintenance. The crane gantry has outstanding performance and stable movement, and no sway during the crane operation. Our gantry lifting equipment has accurate positioning and also requires minimal positioning time. This rail mounted gantry crane has low energyconsumption, greatly reducing running costs. The gantry crane can significantly enhance productivity compared with other lifting systems. This equipmenthas compact structure and easy installation. 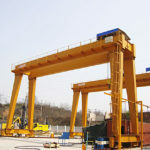 The intended crane buyers are often unsure as to which type of rail mounted gantry crane is right for their businesses. With so many types of gantry cranes in the market, it is vital for customers to understand different types and think about their own needs. The RMG crane we produce mainly comes in two types, that is, single girder crane and double girder crane. The former usually belongs to a lightweight gantry crane and the latter is more often used to handle heavy loads, usually up to dozens of tons or even hundreds of tons. In addition, full gantry crane and semi gantry crane are optional according to your specific working conditions. The gantry crane is typically designed in box type, but when used in harsh working environment such as large wind, the truss type is adopted to reduce wind resistance. Other options such as cantilever and operation methods are determined by users’ practical needs. 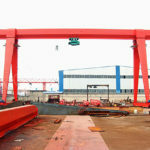 When looking for a gantry crane, you should take several things into consideration so as to select an appropriate rail mounted crane for your application, including but not limited to your required lifting capacity, lifting distance, hook coverage area, lifting frequency, working conditions, your budget and some other safety concerns. After considering these issues, you will surely have a proper evaluation of your material handling needs. Or you can provide some basic information about your requirement, we are happy to help you choose the right lifting equipment. Come to Ellsen and you can find the best material handling solution for your need. The RMG crane is fully electric gantry crane typically designed with three operation methods. It can be operated either from a cab mounted on the gantry crane or on the ground by way of pendant control or wireless remote control. Before buying a gantry crane, you should discuss with the crane manufacturer on the control systems. The pendant control uses a hand-wired button box to operate the gantry crane, which is more suitable to lift small loads. This control system allows operator to get close to the lifting objects, which may also cause accidents and endanger people’s lives. The wireless remote control is widely adopted in many cranes as it is a more secure operation method. It allows the operator to choose the best position so as to have a wide field of vision and avoid dangerous areas. Besides, the wireless remote control has low cost and minimal maintenance, so it is a popular choice among crane users. The cabin control is usually adopted in heavy duty gantry crane to handle large and heavy workloads. The crane operators should receive professional training on the crane knowledge and safety operation regulations. Sometimes, they should co-work with staff on the ground to complete the lifting tasks. The above operation methods can be selected according your specific needs. During the gantry crane operation, operators should never be lax or careless in case the accidents or even fatal accidents occur. Besides, some safety devices can be installed on the gantry cranes to ensure a safe operation such as limit switches, overload limit and anti-collision device. 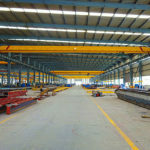 We are gantry crane manufacturer and supplier in China and will offer you factory price of cantilever rail mounted gantry cranes. Besides overhead and gantry cranes, we supply jib crane, electric hoist, construction winch and marine winch to meet your wide applications. We also tailor rail mounted cranes for your special needs. Our gantry cranes have been approved by CE and ISO certificates and have strict quality control. We guarantee to offer the best gantry crane service to customers from the crane design, manufacturing, package, shipping to installation, inspection and maintenance. If you concern the rail mounted gantry crane cost the most, contact us now and we will offer you the most reasonable price.